Gluten-Free Coconut Layer Cake to Wreck Your Diet + Giveaway! I’ve been trying to be all healthy and stuff for the past few weeks, yet I whipped up a gluten-free coconut layer cake. That’s called sabotage, my friends. But for the best of reasons! You see, the lovely people at Bob’s Red Mill are looking for a little recipe development and I drew the “coconut flour” straw. On purpose, because one of the main things I think about since I lost my ability to eat gluten without it attacking my insides, is that luscious coconut cake from the farm of Pepperidge. A cake farm is a beautiful thing, isn’t it? 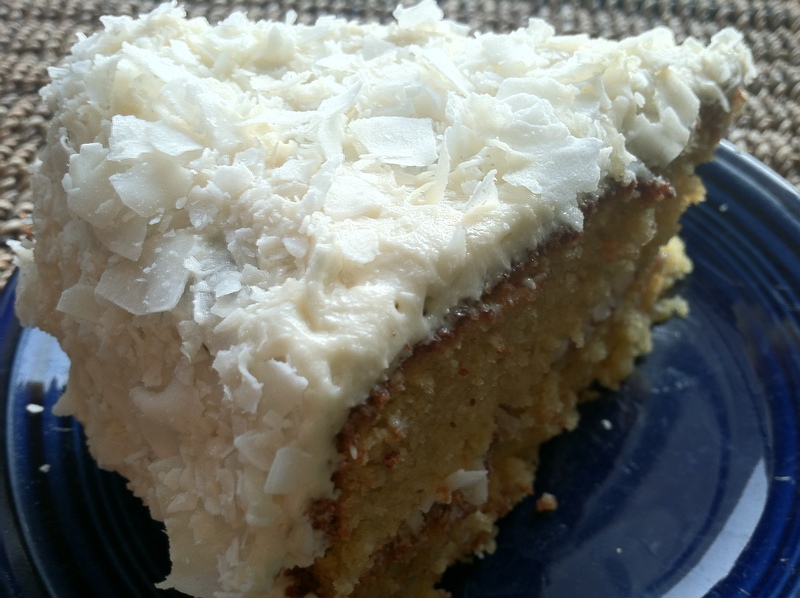 I know those guys don’t use coconut flour in their layer cakes, but when I hear the words “coconut flour” I automatically think about those white layers of icing and cake and a smattering of coconut. Mmmmm . . . smattering. So I was sent some coconut flour and flakes to do some experimenting. (Note, in addition to making this amazoids cake, I made some coconut flour gluten-free meatloaf, and scones. All RAD.) Yet this coconut layer cake was the mother scratching bomb, so I’m going to lay it all out for you. But before we get to the butter cream frosting, let me fill you in about the wonders of coconut flour. Some fun facts, if you will. 1. Coconut flour is hella’ dense, so you’ve got to either cut back on the amount you substitute when cooking gluten-free, or add tons of moisture. Or both! Experiment a lot to get the right texture. Also, you might want to sift it before using to give it some air up in there. I did. 2. Coconut flour is packed with protein. Great for vegetarians and vegans. Or people who love coconut flour, duh. All of this is to say, you need some coconut flour in your diet. I worked with a couple of different recipes and re-jiggered them to create this coconut layer cake, and it was so delicious my husband took half of it to his office to remove the temptation from our home. At least I think that’s why he took it to his office. Hmmmmmm. I, however, can’t seem to stop eating this incredibly moist, fluffy, coconut cake. And there goes my Oscar diet. If you, too, want to blow your diet and wow your office-mates with this gorge coconut layer cake, it’s your lucky day! I’m giving away a bag of coconut flour, and coconut flakes from Bob’s Red Mill, along with a $50 gift card to tha’ Mill. Just leave a comment on my Facebook page telling me how you like to wreck your diet. Easy! I’ll do a random drawing, and announce the winner next week. After the Oscars, and after I can see how much damage having another piece of cake for breakfast is doing to my body. 1. Pre-heat oven to 350 degrees. Grease two 9 inch or 8 inch layer pans. 2. Combine butter and sugar, and beat together for about 2 minutes using electric mixer. Add eggs in one at a time and beat high speed for about 3 minutes. Add in the vanilla while beating the eggs and butter mixture. 3. Combine the dry ingredients together and add one cup at a time, alternating with the milk. Beat batter for about five minutes on high speed. 4. Spoon batter into the two prepared cake pans and smooth tops. Bake for 35 minutes, or until toothpick inserted into the center of cake comes out clean. 5. Place pans on wire rack and cool for 10 minutes before removing from pans. Cool cakes completely before frosting. 1. Place butter in electric mixer and beat with paddle. Add sugar one cup at a time to combine. Add milk and vanilla and mix for 5 minutes until light and creamy. 2. After cakes have cooled, spread one layer of icing on top of cake that goes on bottom. Sprinkle coconut flakes on top, using fingers to place if necessary. 3. Place second cake on top and ice entire cake. Liberally apply coconut flakes using fingers to place. Tags: bob's red mill giveaway, coconut flour recipe, gluten-free coconut cake, gluten-free layer cake, pepperidge farm cake recipe. Bookmark the permalink. I will not question your knowledge of weed. Not at all. Seriously, my coconut flour smells like weed. What gives? ha! maybe there’s weed in your pantry somewhere. i mean, that’s why my napkins smell like coffee. I was told I couldn’t have confectioner’s sugar because the cornstarch may contaiin wheat contaminants. What gives? I so want to try this recipe! Really? I was always told corn starch was gluten-free. In any case, the organic confectioner’s sugar I use uses tapioca starch, which I’ve also been told is gluten-free. I see a ton of recipes that are designated g-free using corn, potato and tapioca starch. I’ve never heard of it being contaminated. Yikes! Awesome! I’m so glad you tried it. This cake is ridiculous. What would be the cooking time and temp if I did cupcakes? 15-20 minutes. Check after 15. Let me know how it goes! I made this cake for a book club meeting as one of the ladies suffers from celiac. It was a great hit among everyone. I live at 7,000ft and this recipe did great at high altitude. Awesome! I need to make this cake again. I miss it. I’ve never tried to sub butter! But if you sort out what works, please do let me know. We did equal parts coconut oil and it worked beautifully. By day 3 the cake was pretty flat but it still tasted wonderful! Thank you! That’s awesome! Day 3 gluten-free anything can be kind of dicey. Glad it worked.